No surprises today over the Fijian Holdings Ltd's decision to bid New Zealander Carl Ngamoki-Cameron haere ra: the parting of the ways was a matter of time after revelations shareholders had very serious gripes about Ngamoki-Cameron and his 'misuse of office'. What has been interesting is the way the board has extricated itself from yet another disaster. Ngamoki-Cameron's appointment has been rescinded by Frank Bainimarama in his capacity as the Minister for iTaukei Affairs. According to reports, the 'rescinding' means Cameron, who challenged the investigation into his impropriety, will automatically relinquish his chairmanship and directorship in all FHL subsidiary companies, where he is a board member. In another supposed show of transparency after being conned and ripped off by yet another chairman, Bainimarama has re-appointed Iowane Naiveli as acting chair. Just nine months ago Naiveli was ressurected from the ranks of retired directors (he opted out in 2008) and made acting chairman because of the double dipping and raiding of the till that led to the sacking of managing director, Sereana Qoro, and chairman Isoa Kaloumaria. As it did with Qoro and Kaloumaria, FHL has damaged control the Ngamoki-Cameron fiasco to avoid having more egg on its face over the dodgy appointments it makes. The post Ngamoki-Cameron FHL board is now made up of Iowane Naiveli, Padam Lala, Sai-moni Lutu, Ulai-yasi Baya and Ilimotama Cawi with the usual but all too shallow reassurance from FHL that it's business as usual. How much was the payout for Ngamoki? This is the problem when Bainimarama, who can't even run a Bean cart thinks he can run a country. All we can see is total failure. As long as Padam Lala is on the FHL board with the corruption scams FHL is doomed. Remember the kickbacks for nabua police building massive rent price. Dont forget the uniform sale scam with dancing police comm-Teleni. When will this idiotic goverment realise that without proper restoration of an elected government and the rule of law put in place together with a functioning government machinery that we will continue to see this type of incidences, costing Fiji millions of dollars. People are brought in from all kinds of backgrounds which are only known to the jokers that hired them. Pathetic pathetic!!! Isa Baya - the marijuana dealer in dreads is a board member,,,sega ni caka e keri na kana karasi Baya! Lailai na dina! This Naiveli was FRU Finance Director for 10 plus years ,,,,look where it got the FRU!! Cameron has made it to the pacific most idiotic award. This should be a warning sign to any professional person not to accept any board appointment with junta or you made a candidate for FICOOK trial. See Mac Patel billionare in gail- FICOOK needs more numbers in gail. Carl was also Voreqe's nominee to the FRU Board as well. He lost out at the last FRU Board AGM election in Sigatoka,having been nominated by Suva Rugby Union which was under the Chairmanship of Francis Kean (VB's tavale)FK must have whispered into VB's ear and so Carl became a Board member as the PM's nominee to FRU.....so there we go. What's going to happen here?.......wananavu!!!!!! Will Carl be asked to refund the $50k spent by FHL under his Chairmanship on that FRU song which was to have hiped up the boys at the World Cup, but our team got wiped out instead with some pathetic rugby scores?....wararasa!!!!! Do you remember the last warm up game in NZ against the AB's before the World Cup? Can't remember the score' but our team got a hell of a hiding there too. Carl was sent over by FRU to hand over the Jerseys to the boys the night before the game .....supposed to be a psyching up ceremony to get the boys worked up before the game. What happened.....the boys went flat and they were walloped by the Blacks. Just like that "Toso Viti" song that had the same effect to the boys at the world cup.....washawasha!!!!! thytah!!!! the fellah looks like a loony, Aiyarse still looking for kaivalagis to fill top posts. The Rt Hon Bainimaichodana kindly please appoint TURUKAWA in one of the boards.He is the most talented chor on this earth. This fella was supposed to be a lawyer...supposed to know more than the average "company director" , so the only conclusion is that he is bent worse than a dogs hind leg. 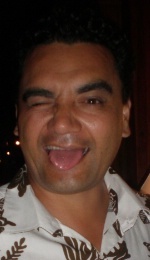 He should be deregistered from practicing law in Fiji and sent back to his Maori marae. This guy was brought in by Kalaveti Batibasaga the con mythological (Witch Doctor) man of Serua after that programme in the radio but has been gagged by his sickness caused by telling lies to the people of Fiji. ....and Pio the PS for VB who directed the Board as soon as he took off on his another Tax payer funded UN trip to have Carl continue to run the show whilst the invetigation is being done? So Pio is VB's boss with ASK at the helm?.....wananavu!!!!! Baya sucked up to the SDL government with his so-called credentials only because he was trying to get a scholarship to do his Masters! Now he is at it again and if something happens to the govt of the day..he will be the first one to jump ship!!! Too much textbook knowledge and no commercial experience!! no wonder he was booted out of Australia! !Loves to blow his trumpet in anyone's direction!!! Ack, don't send him back to New Zealand, his own people don't even want him.